But your previous quote doesn't say "other migration", it says "other waves (plural) of prehistoric migration". So even if Doggerland were a part of this, again there is nothing to suggest it was the origin of such. 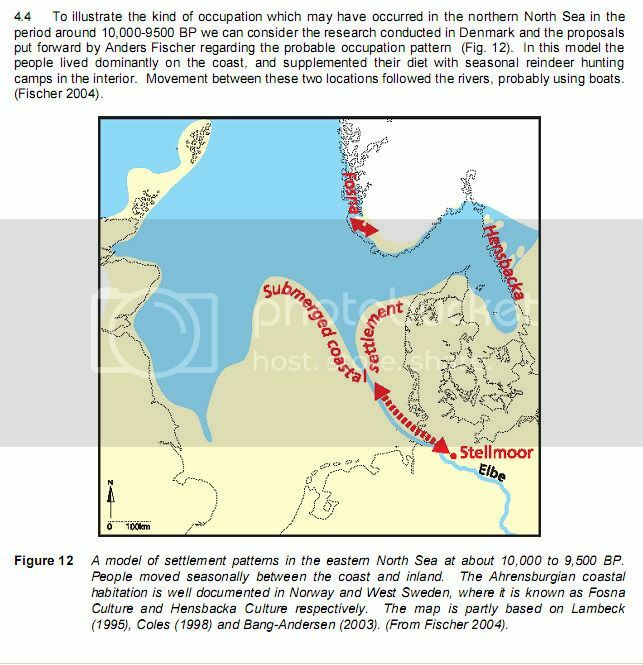 And what these people say is that Doggerland was the best place to be in - in northern Europe - after the end of he last ice age, and that they didn't just 'hunt-and-gather', but that they settled there. I'd imagine that the peoples of Mount Sandel, Ireland as well as Deepcar and Howick House, England and Aero Island, Denmark would have thought that theirs was the place to be as well. And they all didn't "just hunt and gather" either, but settled in their respective areas. Add to this that they date to well before Doggerland vanished. -1- But your previous quote doesn't say "other migration", it says "other waves (plural) of prehistoric migration". So even if Doggerland were a part of this, again there is nothing to suggest it was the origin of such. -2- I'd imagine that the peoples of Mount Sandel, Ireland as well as Deepcar and Howick House, England and Aero Island, Denmark would have thought that theirs was the place to be as well. And they all didn't "just hunt and gather" either, but settled in their respective areas. Add to this that they date to well before Doggerland vanished. -1- Waves, plural, yes. You are not starting to nit-pick now, right? lol. These people just make an educated guess. I am just saying that one of those 'waves' could have come from Doggerland. Maybe it's the only wave of importance. -2- You seem to forget that Doggerland didn't have sharp aligned borders, or high fences. The people and settlements you mentioned were there when Doggerland still existed, and the ones doing the digging said they might have come from Doggerland. Their settlements were occupied during the months the Doggerlanders hunted in those areas, and they must have done so for centuries, so it appears those settlements were occupied all year round, while in reality they just came around every summer and/or spring. No archeologist will be able to tell the difference, right? Do you happen to know about those satellite images I talked about in a former post?? 1) Trying to nit-pick? No, but sometimes the way you word things can be confusing/misleading. No offense meant. 2) No, I'm not forgetting that Doggerland "didn't have sharp aligned borders, or high fences" as you put it. It is however considered to be the area of land between England, Mainland Europe, Denmark and Norway that is now submerged. As there is no physical nor genetic evidence to show WHAT people (whether the same as or different from any others) where in Doggerland or how they used the area it's way, WAY too soon to speculate on what kind of impact they had on the places I mentioned. No archeologist will be able to tell the difference, right? Wrong, as they could tell from the types of floral and faunal remains as to the approximate time/times of year the place was utilized. Do you happen to know about those satellite images I talked about in a former post? Sorry, the first I heard about them was in your post. -3- Wrong, as they could tell from the types of floral and faunal remains as to the approximate time/times of year the place was utilized. -4- Sorry, the first I heard about them was in your post. -1- Yeah, I'm doing my best. Well, I guess you will have noticed that most of my posts are edited. -2- I speculate, based on what's already known, AND what some scientists suggest was going on. -3- Yes, floral and faunal remains. What did people do when they moved long distances to go hunt for months in another area? They take supplies with them, and back then maybe fruit, honey, hazelnuts, and meat. The remains of that food will be found by archeologists, along with the remains of the food these people found (hunted) in the area they stayed. How to tell the difference where what came from? We are not talking about bananas here, lol. It's what this thread has been about from the start. Geomorphologist Sue Dawson said that people have survived and adapted in the past and it is that adaption to climate change that needs to be learned from. One of the team, archaeologist Caroline Wickham-Jones, of the University of Aberdeen, said of their freezing investigations under the December seas off Orkney: "We have certainly got a lot of stonework. There are some quite interesting things. You can see voids or entrances. "There's this one feature that is like a stone table - you've got a large slab about a metre and a half long and it's sitting up on four pillars or walls so the next thing we need to do is to get plans and more photographs to try and assess and look for patterns. "The quality and condition of some of the stonework is remarkable. Nothing like this has ever been found on the seabed around the UK." Geophysicist Richard Bates, from the Scottish Oceans Institute, said: "We've got other sites down on the south coast of England where we have got submerged landscapes, meso-neolithic landscapes as we have here but what we haven't got anywhere else is actual structures. In general Scotland's mainland has been getting higher - but the surrounding islands have been sinking. Sue Dawson, a geomorphologist from the University of Dundee, has been studying how and why the coast line is constantly changing. She said: "One of the key premises behind a lot of the study of the past is that the past is a key to the present and the future. "So we can look to times when maybe environmental changes have been much more rapid and much more catastrophic in some instances and people have survived and adapted and it's that adaption to climate change is one of the key things that we need to get to grips with." The experts said the seabed around Orkney may be littered with man-made structures. Richard Bates added: "Pretty much anywhere in Orkney you can see a vista which has part of man within it, ancient man in the environment. The similar case is going to be in this drowned landscape so the few places we have seen so far are the biggest features but we expect to see much more as we dissect that landscape in finer and finer detail." ANCIENT structures submerged by rising tides thousands of years ago could bring a fresh tourism boom to Orkney, experts predicted last night. Researchers who discovered the first underwater stone remains of their kind in the UK last year have been awarded additional funding to continue their search off the islands. Teams from the universities of Aberdeen, Dundee, St Andrews and Lampeter uncovered structures including stone tables and walling, and what they believe is a graveyard near the island of Damsay. The findings, some of which could date back thousands of years, are providing new insights into the UK’s archaeological history. They are also helping further understanding of how people dealt with climate change in the past. 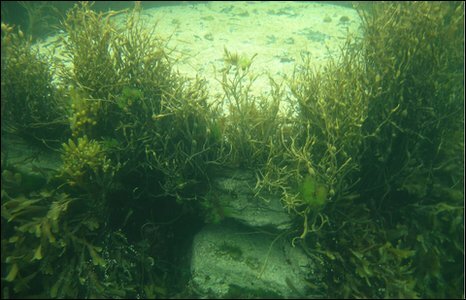 Now new funding from the Russell Trust and Historic Scotland will allow a fresh round of dives to begin next month. Aberdeen University archaeologist Caroline Wickham-Jones, 53, one of the scientists leading the investigation, believes their work could bring new visitors to the islands. “From the start of this project we have had the potential for recreational diving tourism, and how we can make the sites more accessible. “Orkney is known for its rich archaeology but the remains which we see on land only tell us half the story. “When people began to inhabit the island more than 10,000 years ago the sea would have been up to 130ft lower than it is now. “This means that there is a vast potential for submerged archaeology to exist on the seabed around Orkney – and the findings we made last year only scratch the surface of what could be there. “The new funding will allow us to undertake dives to discover new sites for investigation and further examine sites we have already identified. What fascinates me about Doggerland - and I seem to be the only one most of the time - is that it was not generally known to have existed. The former idea was that it was nothing but an post-ice-age landbridge between the present UK and Europe. But it appears to have been much more than just that. What is also revealing is that this large stretch of land doesn't appear anywhere on socalled 'ancient sea-maps' or in 'channeled' info by our present day prophets; to me the very existance of Doggerland proves these guys were frauds. But what I really love to know is if the deluge that destroyed Doggerland can be found in ancient myths on the coasts of the present North Sea (or Ireland and Wales). And yeah, the inhabitants may have been 'nothing but hunter-gatherers', and so not a topic that will tickle the imagination of the Atlantis-addicts around here. -1- Doggerland was the place of origin of the blue-eyed, blond haired white people (they must have originated spmewhere, and some geneticists believe it was in Doggerland). -2- Doggerland was the place of origin of the megalithic culture in Western Europe. Doggerlanders started building wooden temples like the precursor of Stonehenge, and changed to stone structures after they fled Doggerland. -3- It is assumed they were (great) seafarers, and very likely they spread wide and far, and spread their knowledge and culture to the rest of Western Europe, and maybe even to the Mediterranean. The people living in Doggerland were very probably seafarers. But that also means that they must have travelled along the main rivers that ran through Doggerland. And one of the most important rivers - in my view - is the Elbe river. OK, so maybe they sailed on dugout canoos or real ships along the Elbe to trade their merchandize with the people living at the borders of the Elbe. Now what would have been the goods they traded in? Reindeer meat/skins? Fish? Seal skins? Whale meat/blubber/oil? Amber? Timber? Salt? They could have reached as far as present-day Czechia, and walked quite a bit further. I have this image of some big port at the mouth of the Elbe, many thousands of years ago. Not the Dogger Bank hill, nah, a city/settlement located near the mouth of the Elbe, the mouth of that river where it was back then: almost in the middle of the present North Sea. My idea is this: if the image I just described is true, then most certainly there would have been legends, stories, myths of the peoples living on the borders of the Elbe telling us about what had happened to the people they traded with, the people living in the far north. The Rhine river ends up in Switserland, and it's mouth (is that proper English??) was in the present day Channel. There could have been a port/city there, where the Thames and Rhine met (see first image). The Dogger Bank is a moraine, a pile of sand and rocks at the edge of a moving ice sheet. So, what was there on the Dogger Bank? Maybe huge rocks... and maybe these Doggerlanders used these huge rocks to construct the first megalithic structures, like cromlechs and dolmen. And then they sailed up the Elbe, the Rhine and the Thames, and spread their knowledge of how to build megalithic structures. Doggerland has been mentioned on these forums quite a lot over the last few weeks as a site which could have held the lost city of Atlantis due to it being submerged by a Mega-Tusami event at the same point in history that Atlantis is supposed to have sank beneath the waves. Anybody following the debates may be interested to know a documentry is being aired tomorrow in the UK called Stone Age Atlantis. Its on the National Geographic Channel at 7pm and its going to cause controversy as they have evidence the whole land mass went down in one day along with archelogical evidence that there was indeed civilization on the Doggerland land mass. If it makes it to Youtube I may even post a link. No, it was never suggested in that thread - and I should know, I made the most posts in that thread - that Doggerland had anything to do with Atlantis. But I will watch that documentary on BBC. And why don't you post this in that Doggerland thread?? I dont know which one was yours but some of the threads did have it mentioned in including one that I started. Basically there is evidence the Strogga landslide took out the whole of the land bridge connecting the UK to Europe (about the size of California) and that it didnt gradually subside due to rising sea levels at the end of the last ice age. Material evidence has been recovered showing the region was inhabited. YOU started one about Doggerland?? OK, officially I didn't start that thread, but someone started it because of what I posted earlier in another thread, and I was the one adding 99 % of the rest. Btw, I have requested a merge of this thread with that Doggerland thread I linked to. Why create a multitude of threads on one topic when you can put it all in one place?? Melting ice - rising seas - a huge tsunami wave heads for the coast. These are not headlines from today; they are stories from our prehistoric past. In Stone Age times - Northern Europe was a wonderful place to live where people pioneered a new, advanced, culture. But these were also times of frantic climate change when the seas were rising; drowning the land. See the story of a lost world in the premiere of Stone Age Atlantis on Sunday 11 April at 7pm. Today, we worry about the effects of global warming, but humans have lived though eras of extreme climate change before. During the Middle Stone Age, the world's seas were rising far more rapidly than today. In Northern Europe, an area the size of California disappeared under the waves. This programme features the archaeologists who are now reconstructing this lost land and have given it a name - Doggerland. I thought a fresh thread to make everyone aware on the documentry was needed. If you miss it its repeated twice throughout next week according to Nat Geos website. Doggerland is a fascinating topic and I have a feeling about this one that makes me think we're on the verge of something big like we are about to find out anceint Britain started Western Civilization not the Greeks. I don't know who is the admin here, but when do you merge a 19 page thread with a 2 post thread and give it the title of the the 2 post thread?? OK, Alien Being, fill up the thread with your Atlantis crap. And be glad I can't delete my posts in this thread for hell yeah, I would do it right now. I can understand your frustration, Abramelin. These two threads probably should have been merged (being about Doggerland), but since it was Skeptical believer's wish from post #5 that this NOT become a "Doggerland is Atlantis" thread, that idea seems to have backfired with the new title. Kind of sad, really. Just a miscalculation regarding which thread went first...it isn't any kind of purposeful change to the other topic title. I can change the title to anything anyone wishes. Thank you fluffy, I like Abe and don't want to see him blow a gasket. He did a lot of work on his thread. would make more sense, IMO, to maintain the title from the larger thread. Just my 2 cents. Edit to add: Evidently it got changed while I was posting. Thanks Fluffybunny, much appreciated. There is no need for the kind of outburst and namecalling for something like this; and I do not appreciate the rude "idiot" comment. It is not tolerated towards other members, and certainly will not be tolerated towards staff. A simple note sent to a Mod pointing out a needed change can be dealt with right away, no problem...calling people an idiot(Who are spending their free time trying to help people out) for such matters just isn't acceptable. I spend several hours a day fulfilling peoples request (like merging this thread, solving technical problems, stopping spammers, refereeing arguments... ) and I don't get paid to do so, so slaps in the face like that just are not appreciated. You've moved my Stone Age Atlantis Thread to this one and people wont realise now there is a documentry on tonight at 7pm on the National Geographic Channel in the UK called Stone Age Atlantis which has been investigating the Doggerland region in the North Sea. They have evidence the whole region went down in one go not from rising sea levels at the end of the last ice age. They also have evidence of settlements under the water. If anybody misses it their website says it will be repeated twice next week. the original title was "Doggerland and other lost lands", and subtitle was 'Not Atlantis". If you Google 'Stone Age Atlantis", you will find other sites that actually mention what will be shown: finds off the coast of south England, near the Isle of Wight. I already posted about this (even a video), and I think you won't have to hold your breath in expectation about it..
You suggested earlier you already started a thread about it, but up to now I cannot find it. The idea that PERHAPS the Western Megalithic started there has also been discussed here; it was Jean Deruelle, amongst others, who talked about it first; I even translated a document (pdf) from French to English. Btw, a page back I showed submerged megalithic structures below sea level near Orkney (which must have been close to the northern part of Doggerland.